The new Exynos chipset boasts custom CPU cores, an upgraded GPU, and advanced machine-learning and image-processing capabilities, which should deliver an improved multimedia experience and tighter security. According to Samsung, the CPU will be made up of four third-generation custom cores, which are relegated to power-intensive tasks and can operate at a maximum clock speed of 2.9 (GHz), and another four cores optimized for efficiency. Samsung claims that, with the widened pipeline and improved cache memory of the new chipset, single-core performance will be "enhanced twofold," while multi-core performance will be boosted by "around 40 percent" compared to the Exynos 8895. 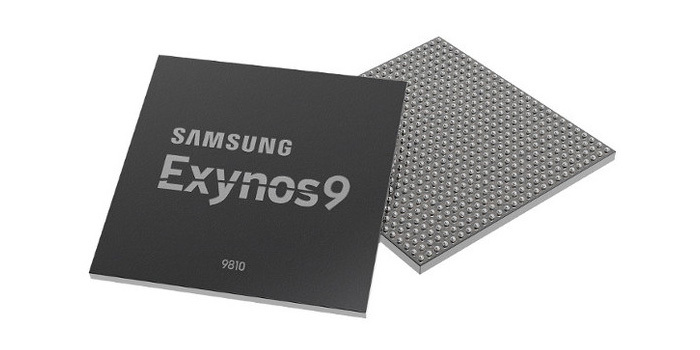 The Exynos 9810 will boast advanced neural network-based learning capabilities, which will be used to power Samsung's "hybrid" 3D face recognition system. According to Samsung, this system will utilize both hardware and software to deliver improved security and realistic "face-tracking filters." The Exynos 9810 also features dedicated image processing and upgraded multi-format codec (MFC), which can be used for advanced object recognition and scene categorization, as well as visual and image processing. Samsung says this could deliver advanced stabilization for images and video of up to UHD resolution, real-time shallow depth-of-field simulation in high resolutions, video recording in up to 120fps at 4K, and vastly improved low-light performance. This will also allow for improvements in Bixby Vision, which uses object recognition to deliver results. The Cat.18 LTE modem inside the 9810 is also among the first to offer 6x carrier aggregation (CA), which (in theory) offers 1.2Gbps downlink and 200 megabits per second (Mbps) uplink speeds, a step up from the previous 5CA modem, which capped out at 1Gps.